Despite concerted efforts to accelerate the identification and treatment of patients with sepsis, County Durham & Darlington NHS Foundation Trust recognised it needed to do more to help its clinical teams drive quality improvement in this area of high NHS priority. Its proactive development of a sepsis care bundle predated the introduction of national policies and guidelines to improve sepsis outcomes – but the real-world demands on its clinical staff created a margin for human error in its delivery. The trust’s performance against national quality improvement indicators was falling short. The subsequent deployment of mobile technology to help expedite diagnosis and escalate treatment pathways has transformed sepsis care across the integrated organisation. County Durham & Darlington is now among the best performing trusts in England in its identification and treatment of patients with sepsis. Improving outcomes for patients with sepsis is a major NHS priority. The condition, which annually costs the NHS an estimated £2.5 billion, claims at least 44,000 lives in the UK each year. Around 14,000 of these deaths are preventable. Studies suggest that patients diagnosed and treated within one hour of presenting with sepsis have an 80% survival rate. However, mortality rates increase significantly with every subsequent hour that treatment is delayed; after the sixth hour, a patient has only a 30% survival rate. A 2015 report by the National Confidential Enquiry into Patient Outcome and Death found that in many cases, sepsis diagnosis was delayed because HCPs failed to record and respond to basic vital signs. The National Early Warning Score (NEWS) has shown to be a reliable indicator of patients at risk of deterioration. It is widely accepted that a NEWS of >5 should always prompt a screen for sepsis. Measures to improve the early recognition and treatment of sepsis have increased in recent years. In 2013, a report by the Health Service Ombudsman for England identified clear failings in how NHS trusts were managing the crucial first few hours of patients presenting with sepsis. It urged wholesale action to address shortcomings and eliminate preventable deaths. In December 2015, NHS England published its first sepsis plan, a cross-system action plan to increase awareness of sepsis and support early identification and prompt treatment. The plan, which followed the introduction of CQUIN goals for sepsis in March 2015, was reinforced by a NICE Clinical Guideline for sepsis the following year. In November 2016, the CQUIN indicators for sepsis and antimicrobial resistance were combined into a single indicator focused on reducing the impact of serious infection. NHS England issued its second sepsis action plan in September 2017. The updated strategy coincided with publication of a NICE Quality Standard for sepsis first recommended in the inaugural plan. Although County Durham & Darlington had no discernible problem with sepsis-related deaths, its focus on sepsis intensified in 2014 when reducing sepsis mortality was identified as a regional priority in the North East. In October 2014, the trust’s 2015-17 clinical quality and safety improvement strategy set out a blueprint to support the early identification and treatment of sepsis. The plan included the trust-wide roll-out of a sepsis care bundle – built around the core principles of the Sepsis Six – and the development of an audit tool to identify outcome measures. However, despite the approach enjoying good clinical buy-in, early results were disappointing. High demand on wards meant that compliance among clinical teams was suboptimal, with nursing teams occasionally – understandably – forgetting to screen patients for sepsis. In 2015/16, the number of sepsis patients receiving antibiotics within the one-hour timeframe was low. The Nervecentre platform uses vital signs, EWS and pathology results to inform the early diagnosis of sepsis. Algorithms, based on sepsis indicators and NICE guidance, are applied to local/regional clinical rules to help identify early onset. Critically, when a patient presents early indications of sepsis, the platform’s intelligent alert system immediately alerts the right clinicians and nurses to ensure that care is appropriately escalated, prioritised and carried out. Moreover, the system not only alerts clinical staff, it intuitively links with pathology to provide clear visibility of when results have been received or are still to be reviewed. The combination of the algorithm, automated escalation and task prioritisation helps eliminate the human factors that can delay the identification and treatment of sepsis. The deployment of the sepsis application, underpinned and powered by the bedrock of Nervecentre’s e-Observations, has meant that every single adult in-patient admitted to County Durham & Darlington’s acute hospitals is now screened for sepsis. This represents a significant improvement on previous performance. Prior to the introduction of Nervecentre screening, 46% of in-patients were screened for sepsis – with levels as low as 37% in Q3 2016/17. By May 2017, this had climbed to 100%. Similarly, the number of adult patients with sepsis receiving antibiotic treatment within one hour of diagnosis has risen significantly. The methodology used to record data in 2016/17 is different from that deployed in 2017/18 – improvements in the identification of sepsis means that the data sample now includes a higher proportion of patients with the condition. Despite this important nuance, the comparative outcomes are impressive. 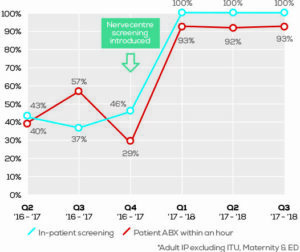 Prior to the introduction of Nervecentre screening, the number of patients administered antibiotics within one hour of a sepsis diagnosis was 29%. In May 2017, that figured had grown to 93% – and has continued to perform in excess of 90% in the months that have followed. County Durham & Darlington NHS Foundation Trust’s 2017-2020 quality improvement strategy reinforces an organisational vision that sets out to be “Right First Time, Every Time.” Technology will play a key role in achieving that vision – but its adoption is an incremental journey. The trust’s use of Nervecentre is making an important contribution to patient care and evolving in response to emergent challenges.